On August 15, 1991, Solemnity of Our Lady's Assumption, near noon after the 10:30 A.M. Mass, in the beautiful and holy chapel of the National Shrine of Our Sorrowful Mother in Portland, Oregon. It was the last day of the Missionary Image of Our Lady of Guadalupe visiting the Portland area. 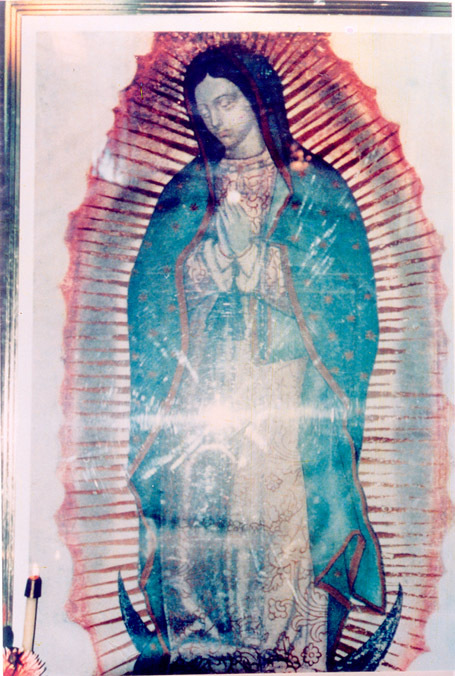 This Image, a special gift from the Bishops of Mexico, had arrived at the Portland International Airport on August 1, 1991 and had been displayed at several churches in Portland before it was placed at the front of the Chapel at the Our Lady's Shrine. Who took this photograph and what was his intention? His name is Benedict Sang M. Lee, a convert to the Catholic Faith from the Presbyterian faith in his high-school years in Korea and an immigrant to the United States in 1972 (after college and military service in Korea). At the time of taking this photograph, he was in some export and import business with Korea. Before that, he had taught Economics at a college in Illinois and, then, worked at a bank in Portland, Oregon. On the day this photograph was taken (August 15, 1991), he attended the Mass at the Shrine together with his elderly mother (in a wheelchair), his wife, and their 11 year-old son. They had been excited after hearing about the coming of the Missionary Image of Our Lady of Guadalupe to the Shrine and carried a camera to the Mass there to make a good replica of the Image that they could place in the living room. He was disappointed, however, because the Image was covered with glass and, therefore, the reflection of the camera flash would ruin the photograph. Feeling frustrated, he nevertheless proceeded to take the photograph anyhow. Of course, he did not even dream about the possibility of anything unusual happening to the photo he was taking. In fact, he had not experienced or witnessed any miracles in his life, even though he had read about the Saints and many miracles during their lives. Maybe it should be mentioned, however, that, three months before taking this photograph, he and his family consecrated themselves to the Sacred Heart of Our Lord and the Immaculate Heart of the Blessed Mother in a small chapel of St. Birgita Church in Portland (after a Sunday Mass in May 1991), because they felt sorry for leading the faith life out of habit. They had no idea about what kind of work the Blessed Mother would assign to them, but were willing to do whatever she asked. When the new images were found in the photograph, did he and his family understand those images as miraculous? The image of the Holy Spirit on the Blessed Mother's right shoulder. As explained in other papers, the Holy Spirit, seen as a dove, is simultaneously looking at the Blessed Mother and at us. This image of the Holy Spirit was initially perceived only as a reflection of a high window in the chapel. It was a lady living in Arizona who called and let us know that it was an Image of the Holy Spirit. It seems enormously appropriate and significant that the Image of the Holy Spirit, the Spouse of Our Lady, was present with Our Lady and also was looking at us giving us His tremendous comfort and encouragement. The image of Our Lady of Naju kneeling, praying, and weeping. This image is located in the lower part of the Blessed Mother's dress. There also are tears on her face and a rose before her nose. There are a couple of images of little babies inside the Blessed Mother's head, neck, and chest. Actually, the white and thick line that forms the contour of the kneeling Blessed Mother's back and bent legs had always existed in the original Image of Our Lady of Guadalupe. But nobody on earth had known this line was to form a part of the Blessed Mother's kneeling image, which was then completed by an addition of a bent line of light forming the image of her head. Very close to Our Lady of Naju is a smaller image of Our Lady of Lourdes on the right side. The image of Our Lady's Immaculate Heart. When we compare the right side and the left side of the Blessed Mother's blue mantle, we can see that the right side of the mantle (from the Blessed Mother's point of view) reaches the floor, whereas the left side of the mantle is lifted up with her left arm and, thus, does not reach the floor. It appears that the Blessed Mother is doing this to form a space or a bag with the folded part of the mantle (over her left arm) so that she could carry something. When we look carefully at this folded part of the mantle, a clear image of a large heart will emerge, which must be her Immaculate Heart in which she wants to carry and protect everyone who seeks refuge in her Heart. In her messages in Naju, she repeatedly calls us to seek a refuge in her Immaculate Heart which is larger than the whole universe. We are faced with very difficult times ahead, as the Angels will bring terrible chastisements and cleanse this world to make it worthy of a new blessed world of one fold and one faith. Where can we find a true security when the storms and calamities fall upon us? Money in the bank? Gold and diamonds? Underground shelters? Connections in the government and businesses? . . . . The Blessed Mother's protection of us with her mantle and in her Immaculate Heart will be the only certain security. How do we receive this protection from her? By doing what she has been screaming to us even until bleeding occurs from her throat: firmly adhering to the truths from her Divine Son and rejecting all errors; observing the Ten Commandments from God; rejecting all the vanities of the secular world and seeking the true treasures in Heaven; forgiving others and respecting every person; always repenting our own sins and frequently and sincerely approaching the Sacrament of Confession; offering up the difficulties in our lives as reparation for our sins and others'; ending all abortions and rejecting all obscenity; guarding the integrity and values of the families; truly believing and worshipping the truth about the Holy Eucharist; praying the Rosary especially with the family to help the Blessed Mother help us all; praying frequently before the tabernacle where Jesus Our Lord is waiting for us; spreading the true teachings of the Church and the heavenly warnings to others; transforming ourselves into truly faithful servants and children of God and the Blessed Mother; . . . . The Blessed Mother's blue veil in the original Image turned into black hair in the photograph. This probably means that it is now about the time for her to receive the royal crown from the Holy Trinity, which will also coincide with her total victory against the Red Dragon. We are living at the end of the current age; this sinful world dominated by Satan will be transformed into a new world opened by the Blessed Mother and reigned by the true King, Jesus Christ, through the Holy Eucharist with the power of the Holy Spirit. There are other significant images also in the photograph, which are explained in other papers. Such large number of new images that powerfully resonate with the authentic Catholic teachings seem to be sufficient to convince anyone that these images in the photograph are miraculous as recognized by several highly reputable priests already. The large number of amazing images alone may not be enough to prove that this photograph is important in the unfolding history of God's plan of salvation of all humans. However, these images are given to us not just on any paper but on the Solemn Image of Our Lady of Guadalupe, which has been repeatedly approved and confirmed by the Bishops and Popes. Especially, Blessed John Paul II visited the shrine in Guadalupe nine times. The question of who took this photograph is a non-issue. The lowliness of the person who was given the task of taking this photograph should not be an excuse for discount the true importance of this photograph. If it was truly a work done by God Himself and the Blessed Mother herself, it must be extremely important to every member of the human race and to the entire Church. Besides, we should not speculate that the new images in the photograph were just a fresh new idea that God suddenly thought of. No! That is not possible, even though it may be possible with humans on earth. The new images in the photograph must have been planned and anticipated at the time the original Image was given by the Blessed Mother 481 years ago. With these new images, the Original Image of Our Lady of Guadalupe has now fully blossomed. The original Image shows that the Blessed Mother is praying hard and unceasingly with her two hands folded and with her two eyes gently looking down. It is impossible that the Blessed Mother prays for almost 500 years and is still unable to receive what she has been praying for, which is opening a new world for her Divine Son. Thus, now is the time that she really reaps the fruits of her prayers. The Mexican people have always believed that Our Lady of Guadalupe is pregnant. "Pregnancy" is not a stagnant concept, but is constantly moving toward the Birth. So, now is the time of the glorious Birth of Our Lord, in the form of the Holy Eucharist - not as the Eucharist that is misunderstood and despised by many, but manifests its full power and glory as the King and the true God. There have been some actual cases where carrying this photograph in the car prevented accidents and protected the drivers and passengers and also that the evil spirits ran away and did not return when this photograph was placed in every room of the house. Some people smelled the fragrance of roses from the photograph. This may only be the beginning of what the Blessed Mother plans to do using this photograph. As we all know, the original Image of Our Lady of Guadalupe was a product of God's Divine Hands. Likewise, there has been no human touch at all to this special photograph of Our Lady of Guadalupe. An image drawn directly by God or the Blessed Mother cannot be at the same level as those drawn by humans. We hope that everyone who owns this photograph truly realizes that it is a living image of Our Beloved Lady who is present with us. Now, we should be more explicit and more resolute in our serving the Blessed Mother for the greater glory of God. Please visit our website for more explanations of this photograph. To order more of this photograph, please write to Mary's Touch By Mail, P.O. Box 1668, Gresham, OR 97030. We are not setting a price for this photograph, as we believe that it cannot be a commercial item but is a personal gift from the Blessed Mother for every individual in the world. Still, a flow of donations is necessary for us to continue this mission of sending the photograph to more people in the world along with the information on the messages and miracles in Naju and, most importantly, the authentic and genuine Teachings of the Catholic Church. So far, we have felt that there are many people in this world finding difficulty in understanding this special photograph of Our Lady of Guadalupe. On the other hand, those who are already well versed in the history of Our Lady of Guadalupe and faithfully adhere to the authentic teachings of the Catholic Faith easily grasp the important meaning and value of this photograph as well as the original Guadalupe Image. Therefore, the promotion of this photograph must go hand in hand with more education in the original history of Our Lady of Guadalupe as well as the contents of the traditional Catholic Doctrines, Commandments, and Devotions. This is truly an enormous but exciting and rewarding task that we can accomplish together.